Grated or mashed, mung bean is an essential component in many Asian dishes and learning how to cook these beans properly is a fundamental skill for every cook to master. The traditional way of cooking the mung bean is to steam the beans and then use a potato ricer to grate or mash the mung bean. If you’ve done this, you know this process is really time-consuming and requires multiple kitchen tools. Luckily, there is a much easier way thanks to an appliance that most of us already have in our homes, our beloved rice cooker! You don’t need anything fancy. My rice cooker is super basic and has just 2 settings: Cook and Keep Warm and it does a fantastic job. The secret is all in the timing. Time it right and you will have perfectly prepared mung bean every time! In my video, I mention that cooking mung bean (unlike rice) causes the water to bubble out of the rice cooker so I recommend using a tray or kitchen towel to catch the overflow. Also, don’t fill to the rice cooker’s capacity or you will have one big watery mess. For example, I have a 5-cup capacity rice cooker and so the most mung bean I’ll cook at one time is 2 cups of dry beans. The more beans you put in the rice cooker the more water is displaced. Because I have a rather small rice cooker, I have to add almost an additional cup of water about halfway through the cooking process because so much of it bubbles out. (This may vary if you have a bigger rice cooker.) So it’s best to make several small batches as per the recipe below. It’s still faster than the traditional method and a little less guesswork if you’re not familiar with how your rice cooker handles the beans. Good Luck! If you enjoyed this recipe, you may also like: Make Perfect Rice Vermicelli (Bun) and How to Clean Banana Leaves. Rinse the mung bean several times with water until the water is clear. Allow to soak for at least 4 hours to soften the beans. Overnight is best. If you need mashed mung bean for another recipe: Follow the recipe and add sugar or more salt as called out in that recipe. 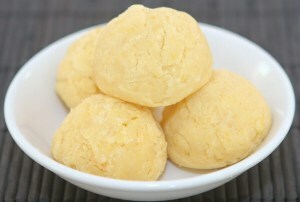 If you need mung bean balls: Allow the beans to cool enough to handle, but still warm. Roll into balls. Wet your hands if they get sticky from rolling the balls. 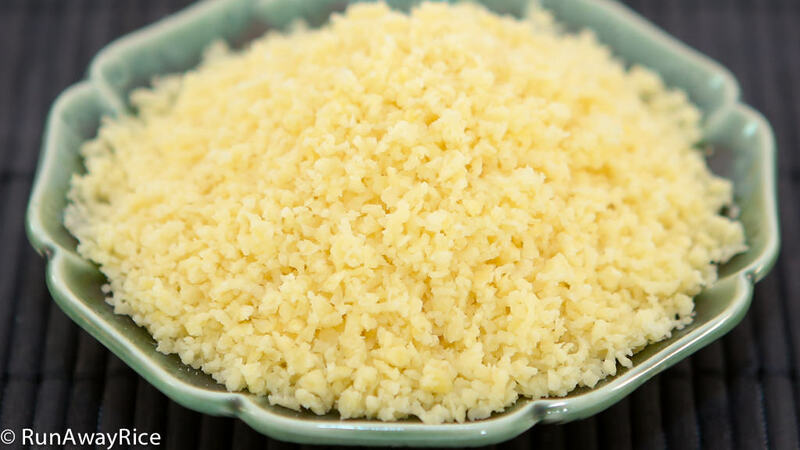 If you need grated mung bean: While the mung bean is still hot, scoop out one half of the mung bean and place on a piece of plastic wrap. Shape the mung bean into a small log and then cover with plastic wrap. Repeat the process making another log so you have a total of 2 logs. Allow the mung bean to cool completely, approximately half an hour. After the logs are cooled, remove from plastic and grate using a cheese grater. I followed your recipe for Banh Tet and it came out awesome. Thank you for sharing it! I am so thrilled to hear that! Great job and thank you for taking the time to share your results. Happy Lunar New Year! I was wondering if i could cook un-peeled mung beans (So normal mung beans) in the rice cooker to make grated mung beans? You can used the unpeeled mung bean. The skins will slide off the bean when you mash it. The mashed mung bean won’t be as creamy and may have a toothier texture. Give it a try and let me know what you think. I absolutely love watching you on YouTube. You have the simplest recipes to follow and they all look delicious! Could you please let me know if I will need to plug my rice cooker back on for the extra 10 minutes and actually cook it again, or is the residual heat enough to cook itge nung beans again for 10 minutes after mashing it? Also, I am going to make the cassava cake. Will I still need to add sugar to the prepared mung bean? I am thinking I might not need to since sugar will already be added to the batter itself? I look forward to your response and your future videos. Thank you for your kind words of encouragement. I appreciate your support! Regarding your question, you do not need to plug the rice cooker back in again. The remaining 10 minutes of cooking uses the residual heat from the cooker. Yes, it’s plenty of heat to continue cooking the beans. For the Cassava Cake recipe, you do not need to add sugar to the mashed mung bean as the 3/4 cup sugar will be added to the batter. Good Luck and enjoy the recipe! Love your site, your a food angel for what you’re providing here! I was curious about the seasoning step for the mung bean, specifically, shall I season to taste, or is there a measurement rule to be observed? Also, how should the final product be stored and what’s the shelf-life for the finished product? I would imagine that the balls save longer than the grated bean, am I wrong in this assumption? Hi Brent, you can definitely season to taste. There’s no special rule. I typically make several batches and freeze for later use in a variety of sweet or savory dishes and so keep the seasoning neutral. Regarding storage, refrigerate all uneaten portions and consume within the week. You can freeze both the balls and the grated bean. I put them in re-sealable plastics bags. Both are good for up to 3 months. To defrost, thaw at room temperature for a few hours or use your microwave’s defrost function. Hope that helps!